For some reason my machine decided to just kick the bucket over at Digital Ocean. I think it happened after some settings I changed in ISPConfig for the server IP information. I was trying to update the information because this was an image I used at an earlier time, and the IP changed. I hopped onto the DO IRC, and did not have any luck. As a side note that blew my mind, one of the admins from DO on the IRC accessed my machine and started helping through the VNC connection – this is outside of their scope of help, but I’ve never had such amazing help from any hosting service before. You might think IRC seems sketchy for help, but instead it is a pool of communal and professional help. The problem ended up being that the “Network Configuration” checkbox had been checked which overrode the settings for Ubuntu’s network, thus giving it a static connection rather than allowing DHCP to handle the network connection; this is something I’m quite used to in Windows, but was something new for me with Linux. It was odd because I noticed the “route -n” command that I had just ran before the server went off the internet had two lines (local loopback and gateway), now it only had one line which was neither, and was missing the gateway route. I tried to add the route but it denied it, I tried starting DHCP (dhclient eth0) but it hung there and did nothing, I recieved messages like: “SIOCADDRT: Network is Unreachable”. When I would restart the machine it would hang on startup saying “WAiting for network configuration” and then “Waiting up to 60 more seconds for network configuration”. I started researching Ubuntu network configuration because at this point DHCP didn’t seem to be working, which is when my Windows static connection instinct kicked in. I ran “nano /etc/network/interfaces” and started checking the information in that file with the information below Digital Ocean’s VNC terminal. So the problem all happened in ISPConfig when I hit save after checking the override box and keeping the default netmask — it assigned the static IP connection information which broke my network configuration. 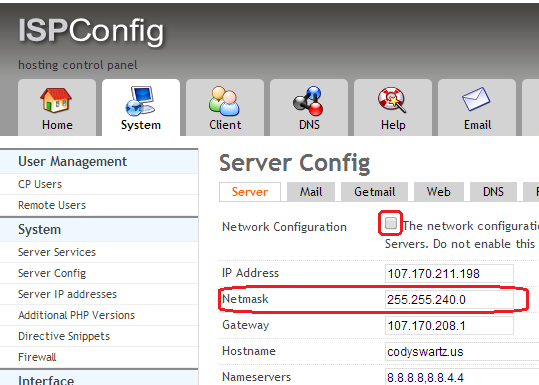 This entry was posted in Interesting Finds, Linux and tagged config, configuration, connection, Issues, Linux, netmask, Network, Networking, Problems, shell, Static IP, Ubuntu, Ubuntu 12.04, VNC. Bookmark the permalink. Post a comment or leave a trackback: Trackback URL.